I was lucky enough to pick up the last Google Nexus 5 device from my local Carphone Warehouse Store (and for a fiver cheaper than the Google Play Store) this morning, and have played around with it for the better part of the day. Having used Android 4.3 Jelly Bean since it was available, I’ve noticed quite a few differences in functionality compared to the latest version: Android 4.4 KitKat. I have been using the Samsung Galaxy S4 for the past few months with the Google Play Edition ROM (on a non-Google Play Edition device), running Android 4.3 Jelly Bean. Upon starting the Nexus 5, I was prompted to download a 139.3MB day-one patch to update the device to the latest version. After setting up the device, it was easy to see a number of differences to the OS straight away. I’ve listed many of the changes I’ve found so far, with supporting screenshots below. It’s hard to say how the battery life compares to the Samsung Galaxy S4 as it hasn’t even been a day since I bought the device. However, I’m expecting that the battery life will be similar to the S4, even though its a slightly smaller capacity. It’s also worth noting that the Google Nexus 5 uses a micro SIM like the Samsung Galaxy S4, so I didn’t need to switch SIMs. It was previously rumoured that the new Nexus device would use the nano SIM found in the new iPhone 5. As expected, the About screen has been updated to match the OS version. You can access this screen by going to Settings > About Phone > Tapping on Android Version several times. 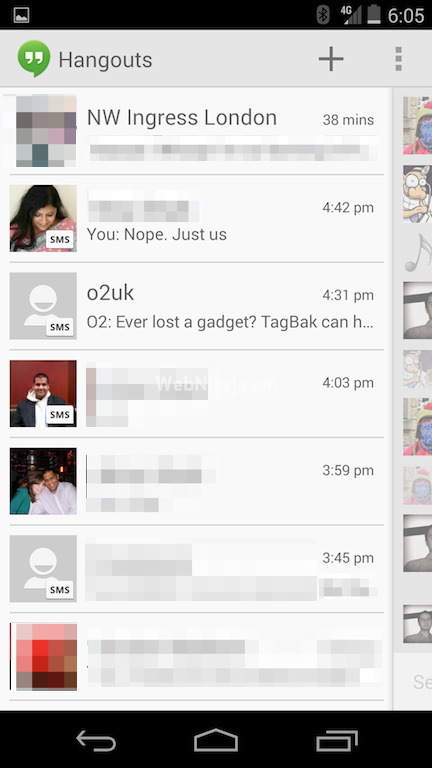 One of the main features in Android 4.4 KitKat is the ability to set your default SMS app. 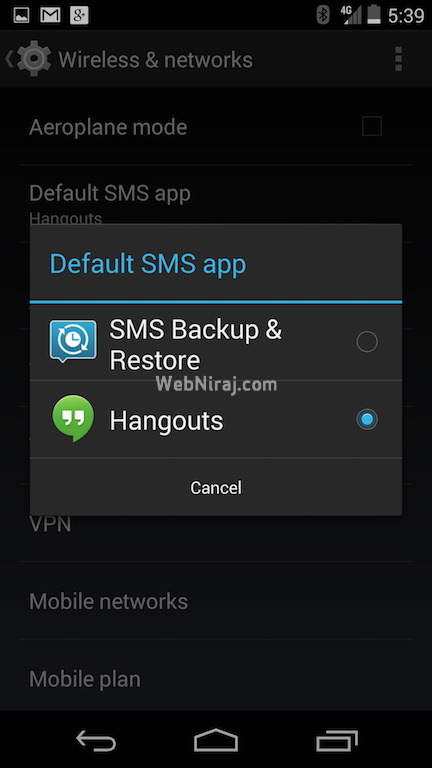 Hangouts replaces the default SMS app on the Nexus 5, but other SMS apps supporting 4.4 can be set as the default. The Dialer has also been overhauled, with a completely new interface. 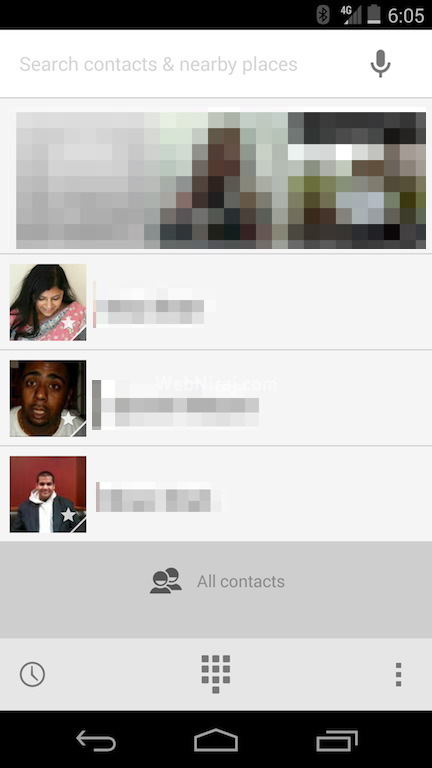 Android now detects the most contacted people and displayed them on the top for easy access. You can still search for Contacts, but it also lets you find numbers for local business you may not already have on your phone. The system UI has been updated, with transparent Status and button bars, and new icons for a number of apps, including Settings, Phone (aka Dialer), Camera and Photos app (not to be confused with Gallery). The system font has also been updated. The icons in the Status bar are also white now, instead of blue. 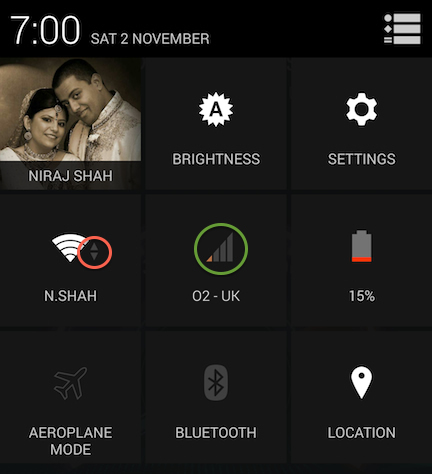 The Wi-fi and mobile signal icons also no longer show network activity. You can find network activity by sliding down the notification bar and pressing the button on the top right. You’ll notice arrows beside the Wi-fi (circled in red) and Signal icons, and when experiencing poor connections / not connected to Google Services, the icons will turn orange (circled in green), but only in this view. Note: Screenshot has been edited to show two different views. 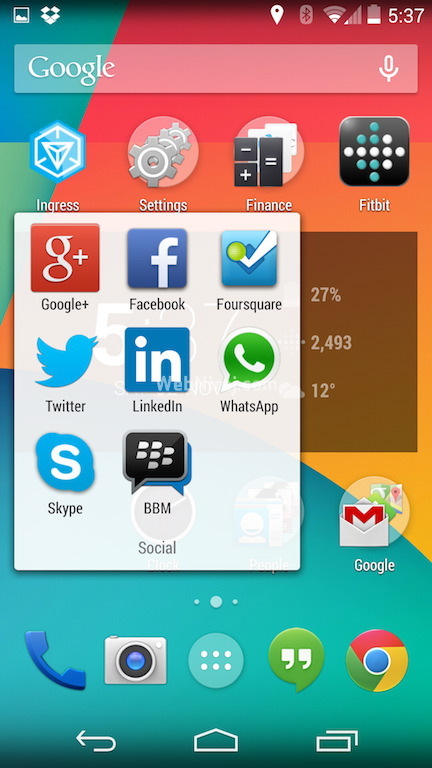 Google Now can now be accessed by swiping from the left of the screen on your home screen. 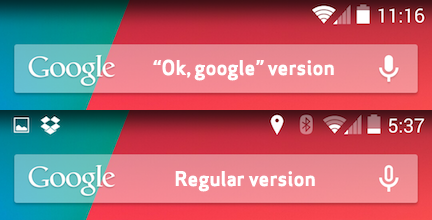 You can still access Google Now by swiping up from the Home button too, as with older OS versions. 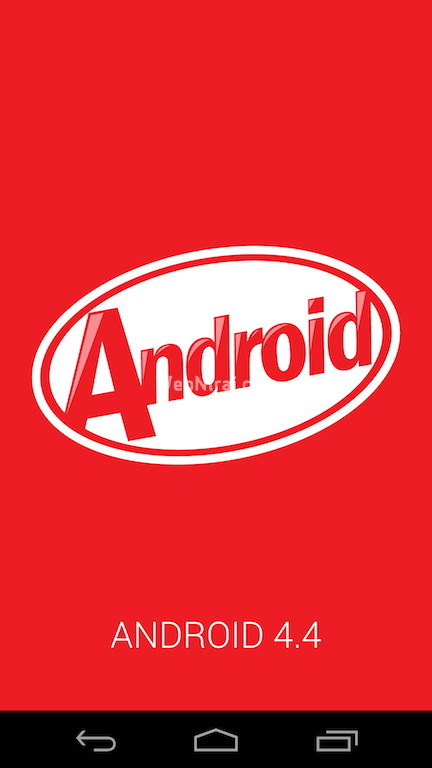 Android 4.4 KitKat has a whole host of new Developer tools too. They are not enabled by default, but you can turn them on by going to Settings > About Phone > Tapping on the Build Number until Developer Mode is activated. The new Process Stats view lets you monitor memory usage for installed application, allowing you to easy detect high-memory and high-CPU consuming apps. 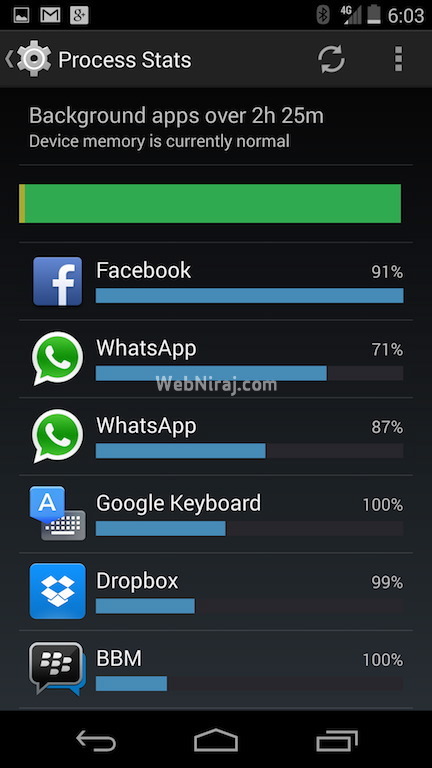 It should help in finding out which apps eat up memory. 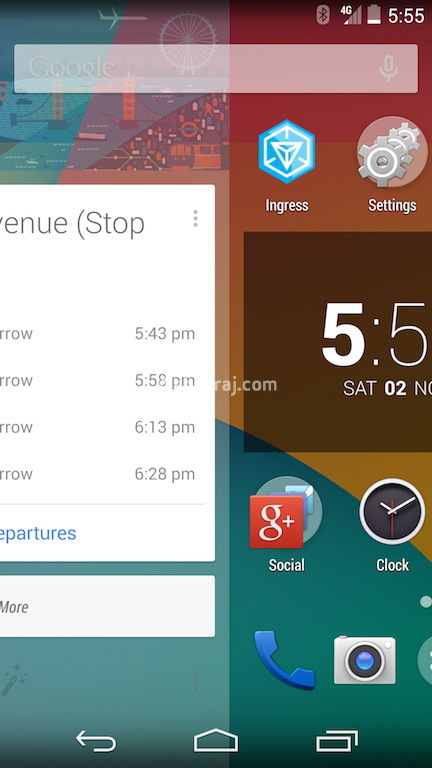 The Widgets & Wallpaper section has also been overhauled in Android 4.4 KitKat. The widgets are no longer displayed in the App Drawer, and instead exclusively accessible by long-pressing on the Home Screen. Wallpapers can also be set this way. The Wallpaper menu has also been refined, with System wallpapers and Live wallpapers all displayed in the same menu. The new Hangouts App is already available on the Nexus 5, and will be coming to other devices in coming weeks via the Google Play Store. 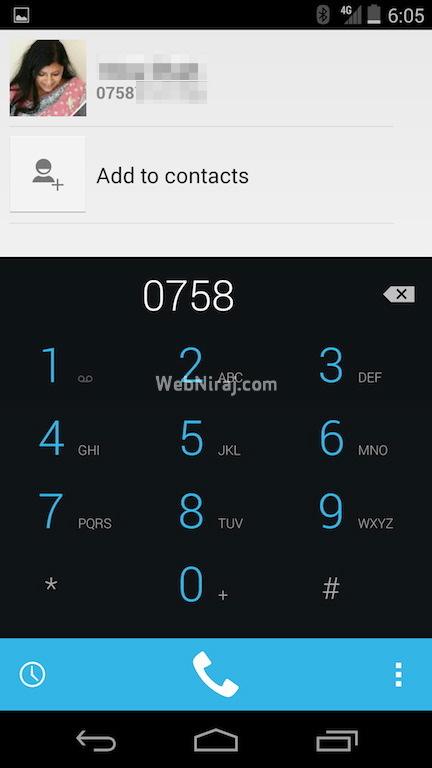 It replaces the default SMS app, allowing you to SMS, MMS or Instant Message friends all from one app. SMS contacts are indicated with a tiny SMS icon. The app is a bit buggy at times, with random slow-downs, but its likely to be fixed in a future update. Messages can something take a while to load, and responsiveness of the app sometimes comes to a crawl, taking a few seconds to update with what you typed in. The GPS icon in the Status Bar has been updated too. The icon now appears along side the static icons, instead of appearing on the left side with app notifications. The below screenshot was taken while playing Google / Niantic Labs’ Ingress. There are probably a number of other changes I haven’t discovered yet, so I’ll update this with any new findings. If you’ve discovered something I’ve missed, feel free to tell me about it in the comments section below. I’ve discovered a number of other changes after spending another day playing around with the phone. 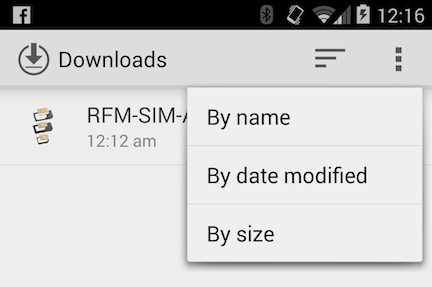 As mentioned in the Android 4.4 Changelog, the Downloads app has been updated, allowing you to sort your downloads in one of three ways. The app has also received a new look, more inline with Android 4.4’s UI. A new tile has been added to the Quick Settings view, allowing you to access the new Locations menu quickly. The menu allows you to change how the device location is obtained, allowing you to switch between: High accuracy (GPS, Wi-fi and mobile network), Battery saving (Wi-fi and mobile network) and Device only (GPS only) modes. I’ve also noticed that the voice activated version of Google Search only works when you’re using English (US) language. This can be changed from going to the Google Settings App > Voice > Language > English > Select English (US). If you go to [Settings] > [Apps] > Click on […] (Options) and then select [Reset app preferences], you may get the popup if you have more than one compatible app installed for the action you’re trying to perform. E.g. 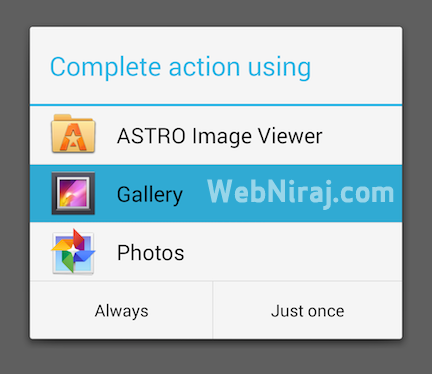 a popup if you have more than one browser installed, or more than one camera app. my device goes into not-connected state even in the middle of the day and i don;t know why. when i turn wi-fi off and then on suddenly the connectivity returns and everything is fine. might there be a way to configure that? There isn’t a way to configure this. It’s done automatically. The loss of connectivity could indicate temporary issues with your ISP or Google itself.